This view looks south from the replica Eiffel Tower located at the Paris resort and casino. Las Vegas Boulevard continues along a south-southwest trajectory from the Las Vegas Strip toward McCarran International Airport (LAS) and points south. Photo taken 02/21/10. Nevada 604 (Las Vegas Boulevard) passed by the Strip 91 Motel, which derived its name from the old alignment of U.S. 91 and 93, at Bruce Street in the city of North Las Vegas. The motel was demolished in 2015. Photo taken 04/01/06. Las Vegas Boulevard advances southwest to intersect Nevada 147 (Lake Mead Boulevard) at an unmarked intersection. Lake Mead Boulevard carries the state route west to I-15 and east to Lake Mead National Recreation Area. Las Vegas Boulevard switches to city maintenance south of North 5th Street in North Las Vegas. The boulevard continues southwest to I-515 and into Downtown Las Vegas. Photo taken 04/01/06. The vintage Normandie Motel neon sign marks the gateway into Downtown Las Vegas from Las Vegas Boulevard (old SR 604) south from I-515 & U.S. 93-95 by Mesquite Street. The 1940s sign was relocated from a location along Fremont Street after 2000.1 Photo taken 07/20/14. Las Vegas Boulevard intersects Stewart Avenue by the former Las Vegas City Hall complex. The building now houses the Las Vegas Headquarters of Zappos. Photo taken 07/20/14. Continuing south one block through Downtown Las Vegas, Las Vegas Boulevard (old U.S. 91-93) next intersects Ogden Avenue. Photo taken 07/20/14. Las Vegas Boulevard south intersects Fremont Street at the east end of the Fremont Street Experience. Completed in 1995, the popular attraction features several casinos, shops, hotels, restaurants and sidewalk vendors. Photo taken 07/20/14. Fremont Street extends to the southeast along former U.S. 93-95-466 toward Boulder City. Historically at this intersection, U.S. 91-93 split and U.S. 91-466 continued south toward the Las Vegas Strip. Photo taken 07/20/14. This area is the Las Vegas Arts District and is known for the many neon signs that have been in use in Las Vegas throughout its history. Photo taken 02/20/10. Proceeding south from the Fremont Street Experience, Las Vegas Boulevard intersects Carson Avenue. Photo taken 07/20/14. Southbound Las Vegas Boulevard at Bridger Avenue. Photo taken 07/20/14. Las Vegas Boulevard intersects Clark Avenue by the Lloyd D. George U.S. Courthouse. Photo taken 07/20/14. Bonneville Avenue forms a one-way couplet with Clark Avenue west between South 1st Street near Las Vegas City Hall, and Maryland Parkway. Photo taken 07/20/14. Garces Avenue angles across Las Vegas Boulevard southbound at the succeeding signal. Photo taken 07/20/14. Las Vegas Boulevard (old SR 604) south at Gass Avenue. Photo taken 07/20/14. Nevada 159 (Charleston Boulevard) crosses Las Vegas Boulevard and connects areas south of Downtown Las Vegas with Nevada 612 (Nellis Avenue) east at Sunset Manor and Summerlin to the west. Photo taken 07/20/14. The towering Stratosphere rises 0.6 miles to the south as Las Vegas Boulevard approaches the wye intersection with South 4th Street. Photo taken 07/20/14. 4th Street branches north from Las Vegas Boulevard as an alternate route into Downtown Las Vegas. Photo taken 07/20/14. Wyoming Avenue stems west from Las Vegas Boulevard to cross over I-15 into the Glen Heather Estates and Scotch Eighty neighborhoods. Photo taken 07/20/14. The Stratosphere tops out at 1,149 feet in height, making it the second tallest free standing structure west of the Mississippi River. Photo taken 07/20/14. Oakey Boulevard ties into Las Vegas Boulevard west from the Beverly Green, Alta Vista and Huntridge neighborhoods. Photo taken 07/20/14. South Main Street converges with Las Vegas Boulevard across from St. Louis Avenue east. South Main Street is the former route of U.S. 91 Alternate and SR 601. Paradise Road south from St. Louis Avenue nearby is former SR 605 to McCarron International Airport (LAS). Photo taken 07/20/14. Las Vegas Boulevard runs along the east side of Stratosphere Casino, Hotel & Tower between St. Louis Avenue and Bob Stupak Avenue (former Baltimore Street) west. Photo taken 07/20/14. An Interstate 15 trailblazer precedes Sahara Avenue (SR 589) along Las Vegas Boulevard (old SR 604) south. SR 589 crosses paths with the freeway 0.7 miles to the west along its 4.8 mile course to SR 595 (Rainbow Boulevard). Photo taken 07/20/14. Second photo taken 03/30/08. Las Vegas Boulevard leaves the city of Las Vegas and enters unincorporated Clark County upon crossing Sahara Avenue (Nevada 589). Photo taken 07/20/14. The Drew Las Vegas rises over 60 floors along the east side of Las Vegas Boulevard ahead of Elvis Presley Boulevard. Originally named the Fontainebleau, work on the resort got underway in 2007, but was halted in 2009 due to the economy. The property changed hands in 2010 and again in August 2017. With new ownership, work to complete the complex continues through late 2020.2 Photo taken 07/20/14. Traffic signals operate at SLS Way, the entrance to SLS Las Vegas resort. SLS Las Vegas was constructed at the site of the old Sahara Hotel. The Sahara closed on May 16, 2011. Photo taken 07/20/14. This button copy sign posted ahead of Circus Circus Drive shows the only indication of the historic existence of U.S. 91 and 466 through Las Vegas. Only the imprints of the former routes remain on this vintage sign. Photos taken 07/06/18. Circus Circus Drive stems west from the first of back to back signals along Las Vegas Boulevard to the Circus Circus hotel & resort and Industrial Road. Photo taken 07/20/14. Elvis Presley Boulevard follows east to Paradise Road. The Riviera Hotel and Casino was formerly located along the east side of Las Vegas Boulevard here. Opened in 1960, the 13-building complex was anchored by a 24 story tower. The Riviera closed in May 2015, and demolition work at the property proceeded to completion in August 2016. The 26-acre site was purchased by the Las Vegas Convention and Visitors Authority, with plans to expand the convention center.3 Photo taken 07/20/14. A pedestrian signal operates by the future Resorts World Las Vegas where the Stardust was located until its implosion in 2007. Anticipated for a late 2020 opening date, the Asian-themed casino will house 3,400 rooms.4 Photo taken 07/20/14. Convention Center Drive links Las Vegas Boulevard with the Las Vegas Convention Center along Paradise Road (former SR 605). Photo taken 07/20/14. Las Vegas Boulevard passes over a cut and cover tunnel taking Desert Inn Superarterial at the intersection with Resorts World Drive west and Cathedral Way east. Resort World Drive parallels the controlled access arterial west through the Resorts World Las Vegas property to Sammy Davis Jr. Drive. Photo taken 07/20/14. Fashion Show Mall comes into view on the west side of Las Vegas Boulevard across the seven lane arterial from the Wynn Las Vegas resort. Photo taken 07/20/14. Fashion Show mall is an enclosed retail complex located at the northwest corner of Las Vegas Boulevard and Spring Mountain Road. Opened in 1981, the nearly 2 million acre facility was expanded in 2003. The $1 billion upgrade included the addition of The Cloud, an outdoor multi-media platform.5 Photo taken 07/20/14. Fashion Show Drive runs along the north side of the retail center to Sammy Davis, Jr. Drive at West Desert Inn Road. Photo taken 07/20/14. Across Las Vegas Boulevard from Fashion Show Mall is the Wynn resort. This view looks south along the east side sidewalk. Photo taken 03/30/08. Spring Mountain Road east and Sands Avenue west come together at the ensuing traffic light southbound on Las Vegas Boulevard. Photo taken 07/20/14. The Treasure Island resort resides on the southwest corner of Las Vegas Boulevard and Spring Mountain Road. Photo taken 03/30/08. Passing by Treasure Island, motorists on Las Vegas Boulevard approach the signals with Sirens Cove Boulevard west and the entrance to the Palazzo to the east. Photos taken 07/20/14. Looking south from the pedestrian bridge that connects the Venetian resort with the Mirage resort, this view shows the Mirage, Caesar's Palace, and Harrah's on Las Vegas Boulevard. Photo taken 03/30/08. The driveway for the Mirage loops west from Las Vegas Boulevard at the approaching signal. The entrance for the Venetian ties in from the east side. Photo taken 07/20/14. Caesar's Palace follows on the west side of Las Vegas Boulevard beyond the exit from the Mirage. Photo taken 07/20/14. Caesars Palace Drive connects with Las Vegas Boulevard at the succeeding southbound traffic light. The LINQ and the Flamingo line the east side of the eight-lane boulevard here. Photo taken 07/20/14. Las Vegas Boulevard (former SR 604) converges with Flamingo Road (former SR 592) at a major signalized intersection. Flamingo Road directly links The Strip with Interstate 15 to the west ahead of the Rio hotel and casino. East from Bally's, the six-lane arterial continues five miles to I-515 & U.S. 93-95. Photos taken 07/20/14. This view looks southwest from the sidewalk at Flamingo Road, one of the pedestrian bridges spanning Las Vegas Boulevard, the Bellagio and City Center. Flamingo Road remains a part of SR 592 west from I-15 to SR 595 and east from Paradise Road (old SR 605) to SR 582. Photo taken 02/21/10. Viewing southbound Las Vegas Boulevard toward the Paris and Bellagio resorts from the pedestrian bridge spanning the arterial at Flamingo Road. Photo taken 04/01/06. A staggered intersection joins Las Vegas Boulevard with Paris Drive east to the Paris Hotel and Casino entrance, and Bellagio Drive west to The Bellagio. Photos taken 07/20/14. Aerial view of Las Vegas Boulevard at the entrances for Paris and Bellagio from the replica Eiffel Tower. Photo taken 02/21/10. Harmon Avenue winds between Cosmopolitan Las Vegas and City Center west across I-15 to Panorama Towers. Planet Hollywood Resort & Casino lies north along the arterial to the east. Photo taken 07/20/14. Aria Place spurs west to City Center and Aria Resort & Casino. Aria opened at City Center on Dec. 16, 2009.5 Photo taken 07/20/14. Park Avenue replaced Rue de Monte Carlo west from Las Vegas Boulevard to T-Mobile Arena. Home of the NHL Vegas Golden Nights, the indoor sports and entertainment venue opened in 2016. Photo taken 07/20/14. Las Vegas Boulevard passes between the New York New York and the MGM Grand resorts south from Park Avenue. Photo taken 07/20/14. Approaching the major intersection with Tropicana Avenue (SR 589), Las Vegas Boulevard expands three left turn lanes and a right turn lane. Pedestrian bridges built in 1994 span all four quadrants, eliminating foot traffic across the 10 to 12 lanes of each arterial. Photo taken 07/20/14. Nevada 589 is unmarked along Las Vegas Boulevard at Tropicana Avenue. The east-west route ends at adjacent Interstate 15 just south of T-Mobile Arena. The state route extends through Paradise to Nevada 582 (Boulder Highway) at unincorporated Whitney. Photo taken 07/20/14. Looking south from the pedestrian bridge between New York New York and MGM Grant at Las Vegas Boulevard and Tropicana Avenue. Resorts to the south include Excalibur on the southwest corner and Tropicana on the southeast corner. Photo taken 03/29/08. Las Vegas Boulevard (SR 604) is state maintained through the intersection with Tropicana Avenue (SR 593). Photo taken 07/20/14. Las Vegas Boulevard advances south another mile from SR 593 to ramps with both I-215 (Bruce Woodbury Beltway) and I-15 north. Photo taken 07/20/14. The Luxor and Mandalay Bay line the west side of Las Vegas Boulevard on the ensuing stretch south of the Tropicana Avenue pedestrian overpass. Photo taken 03/29/08. Reno Avenue joins Las Vegas Boulevard with Excalibur and the Luxor west to Frank Sinatra Drive, the east side service road for Interstate 15. Photo taken 07/20/14. Continuing south by the Luxor toward Mandalay Bay Road on Las Vegas Boulevard. Photo taken 03/31/08. Four Seasons Drive stems east from the entrance to Mandalay Bay resort on Las Vegas Boulevard to air cargo areas of McCarron International Airport (LAS). Photo taken 03/31/08. Southbound Las Vegas Boulevard expands with a dual right turn lane for the upcoming intersection with Russell Road. Russell Road comprises a six-lane arterial west to a diamond interchange with Interstate 15. Photo taken 03/31/08. The Las Vegas Strip is designated as a Nevada Scenic Highway, and that designation ends at the intersection with Russell Road. Photo taken 03/31/08. Russell Road doubles as Nevada 594 west 0.723 miles from Las Vegas Boulevard to Polaris Avenue on the west side of I-15. The New Las Vegas Stadium site (future home of the NFL Raiders) lies between the freeway and Polaris Avenue between Russell Road and Hacienda Avenue. Photo taken 03/31/08. The back side of the "Welcome to Fabulous Las Vegas" sign invites visitors to return. The sign stands within the median of Las Vegas Boulevard midway between Russell Road and Sunset Road. Photo taken 03/31/08. Sunset Road crosses paths with Las Vegas Boulevard by the Town Square Las Vegas retail development from the south side of McCarron International Airport (LAS). Sunset Road is Nevada 562 east. Photo taken 03/31/08. Running along the east side of Town Square Las Vegas, Las Vegas Boulevard approaches a diamond interchange with Interstate 215. Photo taken 03/31/08. A flyover shuttles drivers across Las Vegas Boulevard south from northbound into the Town Square Las Vegas development. Photo taken 03/31/08. The succeeding right turn from Las Vegas Boulevard south connects with ramps to both Interstate 15 north to Downtown Las Vegas and Clark County Route 215 west to Spring Valley and Summerlin. Photo taken 03/31/08. Las Vegas Boulevard passes over the Bruce Woodbury Beltway ahead of the eastbound on-ramp for I-215 to Henderson and George Crockett Road. Photo taken 03/31/08. A somewhat erroneous shield references Interstate 215 with a business loop color scheme. A portion of I-215 between Paradise and Henderson is maintained by Clark County and not NDOT. Photo taken 03/31/08. There is no direct ramp from Las Vegas Boulevard to the I-215 ramp for Interstate 15 south. Instead motorists are directed to remain south on the arterial 1.4 miles to SR 160 (Blue Diamond Road). Photo taken 03/31/08. The next major intersection along Las Vegas Boulevard south is with Warm Springs Road by the The Las Vegas South Premium Outlets. Photo taken 03/31/08. Nevada 160 begins and follows Blue Diamond Road west from Las Vegas Boulevard and Windmill Lane directly into an interchange with I-15. Photo taken 03/31/08. Nevada 160 is a commuter route arcing west from I-15 to Enterprise. Beyond Blue Diamond, the rural highway continues to Mountain Springs and Pahrump. Photo taken 03/31/08. A former southbound confirming marker posted along Las Vegas Boulevard beyond the Las Vegas Strip. All remaining signs for SR 604 south of Downtown Las Vegas by 2008. Photo taken 11/12/00. Daily Neon: Normandie Motel Sign. Las Vegas 360 web site. "Fontainebleau on Las Vegas Strip has new name and opening date." Las Vegas Review-Journal (NV), February 12, 2018. "Watch: Implosion of last tower of famed Vegas hotel and casino." CBS News, August 16, 2016. 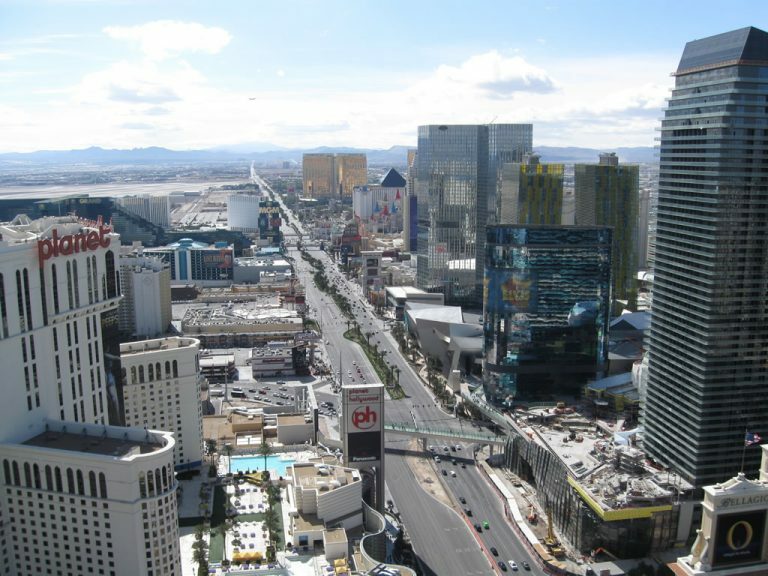 "How 2020 Could Remake The Las Vegas Strip." Las Vegas Weekly, June 14, 2018. Las Vegas Historical Information. Las Vegas Online Entertainment Guide.